Making gingerbread men is a holiday activity that everyone can enjoy, from adults to children. But do you know the story behind the delectable treat or how gingerbread men and Christmas became synonymous? There is more to this holiday treat than fancy decorations. It was at the court of Elizabeth I of England when the first instance of gingerbread biscuits shaped in different figures was documented. This is why the invention of the gingerbread man was credited to Queen Elizabeth I. Where it originated, however, is embedded in many theories, so there’s no one true answer for this. But many believe that it might have come from the Middle East since spices used to bake gingerbread man came from there. But references of the biscuit also go as far back as the ancient Egyptians and Greeks. It is a different story with the gingerbread houses, however, because they have clear origins and that is Germany during the 16th century. They were then associated with Christmas traditions. The treat’s popularity grew more when the edible house made an appearance in the Brothers Grimm’s Hansel and Gretel. Gingerbread became a part of American history when George Washington's mother made a gingerbread cake recipe in 1784 which became Abraham Lincoln's most favourite treat. In the Lincoln-Douglas debate, Lincoln even invoked a gingerbread anecdote. 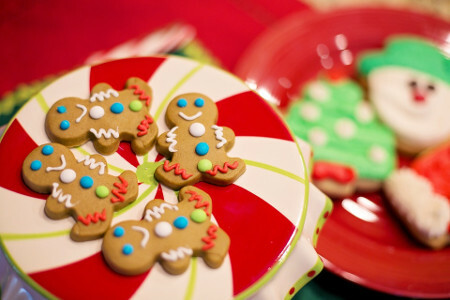 The link between gingerbread men and Christmas was established when gingerbread cookies were used as holiday decorations. Depending on the season, their figures also change. During the Crusades, gingerbread was originally made using breadcrumbs that are seasoned heavily with spices and boiled with honey. The mixture was then pressed into cookie boards, which are slabs of wood carved with religious designs. As time goes by, the recipe to make gingerbread men varied. But it still remains a delectable homemade Christmas present that is great to bake with the kids. 1. Sift the flour, ginger, bicarbonate of soda, and cinnamon together and pour them into your food processor bowl. Then add in the butter and blend the mixture until it resembles breadcrumbs. Then stir in the sugar. 2. Beat the egg and golden syrup together and add to the food processor until the mixture all clumps together. Tip the dough out, knead briefly until smooth, wrap in clingfilm and leave to chill in the fridge for 15 minutes. 3. Preheat the oven to 180C/350F/Gas 4 and line 2 baking trays with greaseproof paper. 4. Roll the dough out to a 0.5cm/¼in thickness on a lightly floured surface. Using cutters, cut out the gingerbread men shapes and place on the baking tray, making sure to leave a gap between them. 5. Bake the gingerbread men for roughly 12-15 minutes, or until golden-brown. Leave on the tray for 10 minutes and then move to a wire rack to finish cooling. Once cooled you can then decorate them. If you're planning to give out gingerbread man as presents, order flowers from Clare Florist to go with it. Nothing says Happy Christmas more than a festive floral arrangement. We carry a wide array of flowers and bouquets perfect for the Christmas season.